The categorization of rodents include numerous species with a global presence. Squirrels, mice, rats and beavers are few of the common rodent species. Many rodents like mice and rats have a flexible diet and the ability to adapt to many environments. Others, like the squirrel and beaver, have more specific food and environmental requirements. Beavers are exclusive plant eaters. They primarily eat grass, twigs, bark and whatever trees are available. Rats and mice also consume plants on a regular basis. They eat grass, grains and small twigs. Porcupines eat young fir cones and squirrels eat cones and bark as well. Rodents also consume seeds from plant sources. Most rodents are nut eaters. Squirrels are the primary nut consumers and many rely on nuts for year-round food. Rats, mice and porcupines are also nut eaters. They do not target nuts specifically but do eat them opportunistically. Some rodents are meat eaters. Rats are especially prone to eat meat and fish. Rats are capable of digesting rotten meat and will consume scraps from human trash. They will also scavenge carcases left by other animals and roadkill. Rats are opportunistic feeders and will consume any meat available. Rodents eat fruits and berries in wild and natural settings. They also capitalize on human trash to locate and consume fruits where the food is not otherwise available. Fruit is a regular food source for rodents in tropical environments where it grows prolifically. 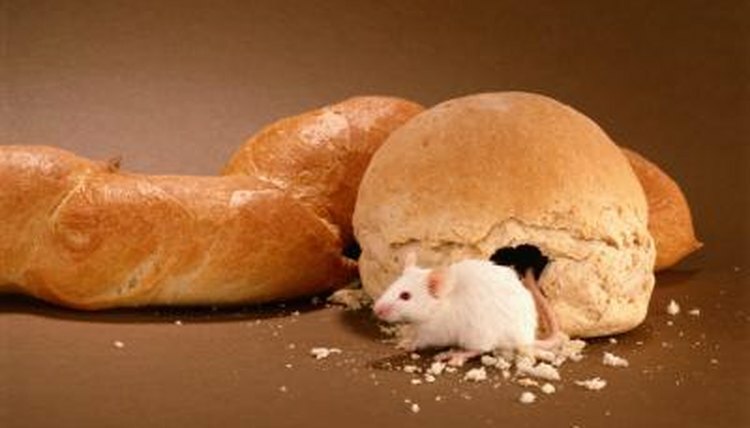 Many rodents will consume food left by people. Domestic dog, cat and livestock feed is a favorite for rodents. They also eat dairy, bread, leather products and bird food. Rodents are attracted to salt and they will target worn clothes and shoes for the salt content.